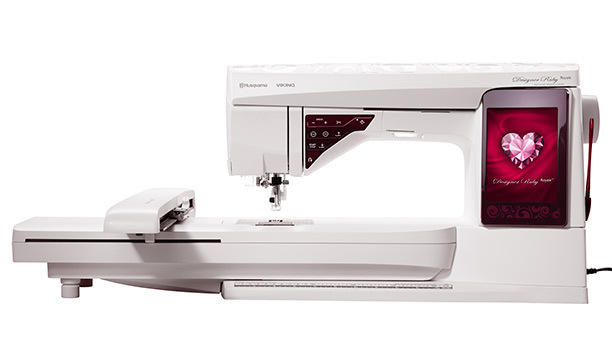 The Designer Epic has all the features a crafter could want and then more! With so many helpful ways to assist you with your project, it is guaranteed to create a beautiful product every time! Our largest embroidery area ever! Even more generous sewing area!. There are no limits to your larger than life projects, quilts home dec projects or fashion. Embroider up to 360x260mm, non turnable*. Largest sewing area, more than 12” x 5 1/2” (310x140mm) work area. ​*With the optional DESIGNER™ Majestic Hoop you can create and embroider designs up to 360x350mm without re-hooping. - Use the industry-first, patent-pending Dimensional Stitches to add appliqué fabric or pop-up effects for exceptional decorative results. - Enjoy perfect, even feed when quilting, sewing on stretch fabrics, napped fabrics, or leather with the included Interchangeable Dual Feed. - Experience more beautiful embroidery than ever with less adjustments, even with challenging metallic threads, thanks to the industry-first deLuxe™ Stitch System. - Navigate intuitively on the exceptional Ultimate Interactive Screen, now with wider viewing angles and more radiant colors. - Choose from a variety of built-in shapes to create appliqué embroideries instantly with the new Design Appliqué feature. - Match embroideries easier than ever with the Design Positioning feature. 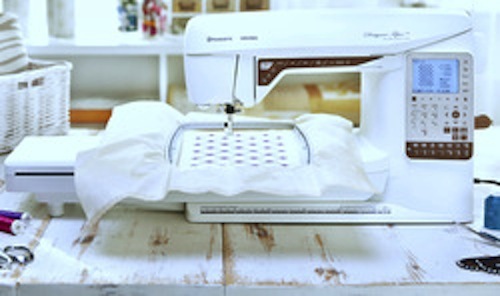 - Enjoy the generous sewing and embroidery surface when creating large projects. - Choose from hundreds of stitches and exclusive designs provided in our DESIGNER™ Selection. - The unique EXCLUSIVE SENSOR SYSTEM™ technology senses your fabric thickness for perfect, even feeding. - The exclusive SEWING ADVISOR® and EMBROIDERY ADVISOR™ features deliver built-in guidance when you need it most. 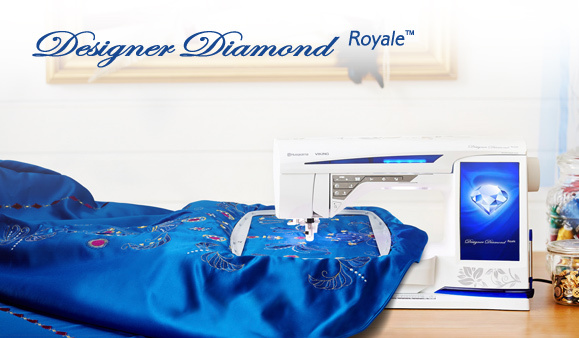 - Your DESIGNER DIAMOND Royale™ machine reduces your embroidery time by 20 % or more* – the perfect time-saver for every embroidery. 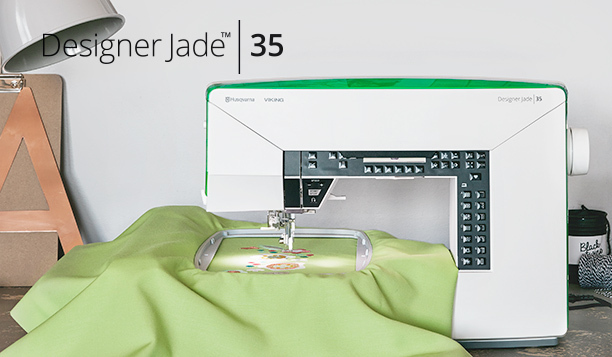 - A Smart Save feature saves your embroidery projects, even if you unexpectedly lose power. - Your DESIGNER RUBY Royale™ machine reduces your embroidery time by 20% or more* – the perfect time-saver for every embroidery. * Compared to the DESIGNER RUBY deLuxe™ machine. Actual time depends on hoop and embroidery type. - The DESIGNER RUBY Royale™ machine has the largest embroidery area in its class*, allowing you to stitch spectacular designs with just one hooping. * Non-turnable; as compared to leading brands in similar price range. - The sewing surface is designed for large projects and unlimited possibilities. - The Interactive Color Touch Screen lets you intuitively navigate through various screens for embroidery, editing, and sewing. - The Design Positioning feature lets you join large embroideries with perfect placement every time. 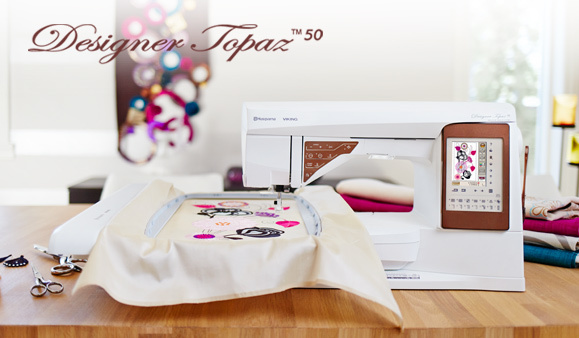 - Internet updates ensure that your DESIGNER TOPAZ™ 50 sewing and embroidery machine is always up-to-date. - The Embroidery Design Editing and Save features enhances your embroidery creativity and allows for a more personal and precise result. - The large embroidery area (360x200) allows you to stitch spectacular designs with just one hooping. - Hundreds of breathtaking embroideries and stitches inspire endless creativity. - The Exclusive SEWING ADVISOR® feature optimizes your sewing by selecting the best settings for you and giving you on-screen advice. - Automatic Jump Stitch Trim eliminates trimming time as you create beautiful embroideries. - More than 250 stitches including; 7 mm stitches, Utility stitches, Quilt stitches, Decorative stitches and 5 Programmable Alphabets. 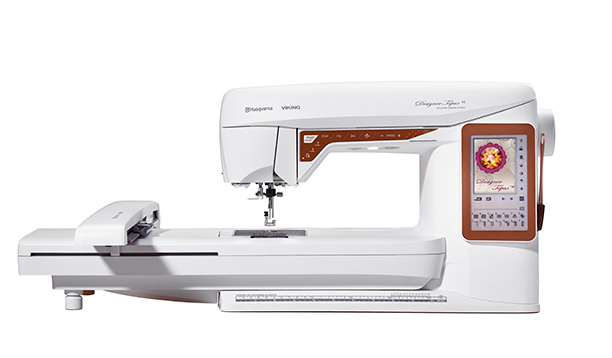 - The Color Touch Screen lets you intuitively navigate through various screens for embroidery, editing, and sewing. - The Basic Design Positioning feature lets you join large embroideries with perfect placement every time. - Internet updates ensure that your DESIGNER TOPAZ™ 40 sewing and embroidery machine is always up-to-date. - You can create and embroider designs up to 240x150mm (9½”x6”) without re-hooping. - Sew large projects easily thanks to the large area to the right of the needle, 200mm (almost 8"). - More than 13 optional hoops in different sizes and for several uses. For special techniques like endless embroideries, quilting, textured embroideries and much more. - More than 200 stitches, 7mm stitch width. 4 sewing fonts with both upper and lower case letters for easy programming. - The large embroidery area (240x150) allows you to stitch spectacular designs with just one hooping. You can create and embroider large designs without re-hooping up to 240x150mm (9 ½” x 6”). The large DESIGNER™ Jewel Hoop 240x150mm (9 ½" x 6") is included with your DESIGNER JADE™ 35. HUSQVARNA VIKING® is constantly developing new hoops and accessories for various techniques.